wow, ya I’m not usually a green kinda cheeese girl, but I would give it a go in this. Cheese is never boring! Nope I am fully in love with white pizza. I could not go pass blue cheese too; you know how to celebrate a Thursday/Wednesday. This looks so delicious- I love your pictures! Definitely want this with a tall glass of wine! Gorgonzola and I have a healthy relationship…meaning I can literally unwrap it and eat it like a candy bar. Is that weird?….I sure hope not. Wow…I am seriously drooling over this flatbread! I’m going to serve it with a nice salad and a glass (or two) of red wine! Cheesy bread can TOTALLY be a snack. And yes to Gorgonzola! So good. I’m so making that. I always have four cheeses (incl blue) in my fridge waiting to be used. Saturday lunch it is. What I am loving is the not having to WAIT for the dough to rise! Instant cheesy gratification at it’s best. Thank you! Looks perfect! :) Four cheese heaven! 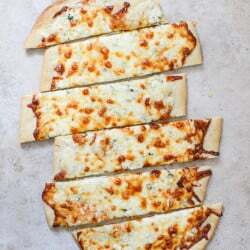 Growing up, I only liked cheese pizza and made my parents order it with “light sauce.” This super cheesy bread is like the perfect thing for me! I would totally eat it as a main meal. This is like ……………………its the first day of spring ,take a deep breath , make this cheesy bread and sit back with a glass of wine………. This looks soooo good. I’m definitely on the fence about the gorgonzola. I detest bleu cheese but have never tried gorg so I guess there’s a first time for everything. Cheese and bread always wins. Love this idea! Looks so good! Oh how i love cheese!!!! and bread!! I made something similar two nights ago, only mine was tre formaggi :) had it as main meal with big green salad. Gotta love the mikly taste of mozzarella cheese. I’m in love with this. Completely and totally in love!!! Yummy! I’m just getting into blue cheese but I bet the gorgonzola tastes amazing in this! Add another thing to that list: breakfast. It could totally be breakfast. I’m kinda mad that it isn’t my breakfast, right now. Actually, I think anything covered in neon sprinkles has your name all over it (and mind you, I don’t know you in real life haha). … but this DOES look delish! I need this in my life, love! If you have not had the Garlic Bread with Wisconsin roth kase blue cheese fondue from Michael Jordan’s Steakhouse you are seriously missing out. It is a cheesy bread game changer! When I read “four cheeses” I had to come and have a look. I was not disappointed. This makes me hungry…and I just had dinner. I think Martha Stewart once said the good rule to a great cheese plate is something old, something new, and something blue. Words to live by! I’ll always go for that stinky blue! I could live off this and this alone!!! I see this pizza in our weekend plans! I love all the cheese! Gorgonzola included. Last night we went out for italian food and got a skillet of baked cheese…I told my husband I need more melty cheese in my life. Love this! You never “trash” things up!!!! As piles of cheese are also my favorite thing this will definitely be going into my pile of things to make ASAP. Yum! okay. so, many cheesed flatbread? yes, this looks fabulous. I came here to tell you that I am currently watching Season 3 Episode 1 of Girls. I FINALLY began watching these, um, I started … Monday night? we have gone through 2 whole seasons this week. as soon as I get a few more episodes in this season, I am going to read ALL of your posts about Girls. I want to have these conversations with you!! SO MUCH IS HAPPENING, SO MUCH TO SAY! like, Jessa? is in some rehab or something? Hannah and Adam are back together and Marnie and Charlie are NOT and I am happy about both? also, I love that Kim Gordon from Sonic Youth is Mindy in the rehab group. nice touch. 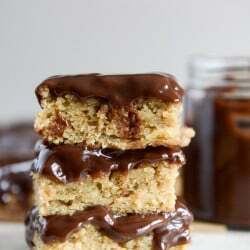 Oh my, that looks truly fantastic. I’m deeply in love with cheese (and bread). if I had these ingredients on hand I’d totally make this right now. Definitely going on my ‘Must Make’ list! I also am an avid cheese lover! These look amazing, would love to serve them up for guests at a dinner party, impressive!